Check this list if you are keen to go on whale watching cruise. There are no Sans Souci departures any more. Let us know if you know any cruises departing from San Souci. Captain Cook Cruises Whale Sighting Guaranteed or cruise again for FREE. Cruise again in the same season for free on Standby Basis confirmed 24 hours prior, subject to availability. 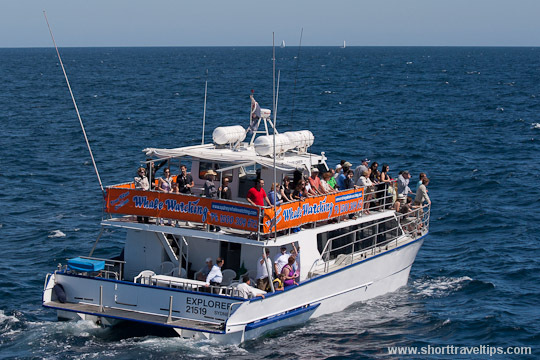 Manly Ocean Adventures If whales are not spotted on a whale watching tour, each passenger will be issued with a ‘Standby Ticket’ for another Whale Watching tour during the same whale watching season. ‘Standby tickets’ are eligible for redemption no greater than 24 hours prior to the new requested departure. Subject to availability. Standby tickets are not transferable. Marimbula Marina In the event that no whales are sighted we will give you the opportunity to come on another whale watching cruise free of charge. This offer is valid for the current season only and is not transferrable. This offer is not redeemable for a refund. If no whales are sighted during the last few weeks of the whale watching season a voucher will be issued for the following whale watching season. So which company to choose? It depends on you – do want only whale watching or to do something else too, like speed boat ride? Do you stay in the city or in Cronulla or Manly? My personal choice was – Bass and Flinders Cruises. They are longest period in this business and also participate in whales research program with Macquarie University, has shore based whale spotters which helps them faster to spot whales. In the sea it looks like all other companies just follow their boats. 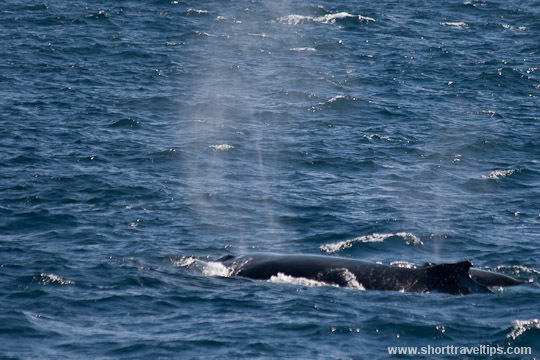 One important thing – lower your expectation if you go on whale watching tour. Sometimes whales are more active, sometimes they are not. I was reading some reviews there customers were complaining – they saw not enough whale breaches because ship went back to harbor as the tour time was out. How you can complain about that? Some people won’t be lucky to see a breach even once and it is not the show where you command whales what they should do. So it is better to have low expectation and you definitely will enjoy whale watching – coastal or on boat tour. Watching Orca’s from a fishing vessel in Alaska is one of the fondest memories I have of being a commercial fisherman. They are truly incredible beautiful creatures. Thanks for reminding me. I would NOT recommend taking a trip with Bass and Flinders. Awful Service, false advertising and blatantly lying to customers. Tom, could you be more specific? Vago, you should go to Caribbean or Tonga to swim(snorkelling) with Humpback Whales, or to Western Australia to swim with Whale Sharks. Did both and that’s indescribable experience, but will try to write more about it in near future. The Philippines also host whale watching activities in Sorsogon. The Whale Sharks are really Gentle Giants. Too bad some people still kill them for their meat! The reason for this comments stems from false information and false advertising of your ship, Ocean Dreaming II, placement during the NYE fireworks. When researching the companies that provide this service of a NYE cruise, I decided I was going to chose a company who had a boat that is closest to the bridge fireworks. After calling Bass and Flinders in August and asking the question of where the boat, Ocean Dreaming II, would be placed during the NYE fireworks, I was told by your staff that the boat would be placed between the Opera House and the Bridge. After hearing this I purchased two tickets, one for myself and one for my wife. We were traveling to Australia for our honeymoon from California and this was suppose to be the big finish we were so looking forward to end our honeymoon. We had planned our entire honeymoon around this event. I called Bass and Flinders one more time in mid December to confirm our tickets and asked your staff again where the boat would be placed and again they said it would be between the Opera House and the bridge during the NYE fireworks. As you can imagine our disappointment as we were one of the furthest boats away from the bridge during the actual NYE fireworks. If I had wanted to be that far back from the bridge I would have paid a lot less money to the companies who were honestly telling me how far back from the bridge they were and pricing appropriately. I also confirmed your staff provided this false information to at least 25 other patrons I had email communications with. They were also told by your staff that the Ocean Dreaming II boat would be between the Opera House and the Bridge during the NYE fireworks. This was a blatant lie as we were not only one of the furthest boats back but had so many boats on front of ours blocking our view that we could hardly see the bridge. By your company and staff’s bait and switch gimmick you ruined what was suppose to be a once in a lifetime experience for my wife and I as well as many others. I am writing to inform you of my complete dissatisfaction and overwhelming frustration with my Bass and Flinders experience. I am really sorry for your experience, but I don’t understand why you are referring to me as to official of Bass and Flinders? I am independent travel blogger and I don’t have any business with Bass and Flinders. Yes,I was on their whale watching cruise in Sydney, I was happy with it and I mentioned about it in this post. That’s it and nothing else. I will forward your complain to them as I am also interesting to hear their explanation. I didn’t know that you could whale watch from Sydney. Thanks for the info! Watching whales is really one of the most unforgettable experience in life. I have also experienced touching whales in the sea. From most whale watching places i found Coolangatta whale watch as one of the adventurous and exciting whale watching Queensland place. They also offer customized tour to suits our needs. were did you get your info from. Hi Alice, on whalewatchingsydney.net site there are daily whale sightings numbers. I always enjoyed watching whales.. Thanks for the info and prices. I’m sure whale watching in Sydney must be awesome! Great info, and the price list is pretty convenient as well, thanks. Keep up the good work! I have a plan to Sydney this year, can you give suggestion to me? @Adrian, when you are planning to go to Sydney and what you are into? Whale watching as well as dolphins make me feel refreshed. I feel like I want to jump in the sea and join them swim. Riding at the back of a dolphin is actually my dream. Oh wow, that is detailed info, thank you for sharing. I would love to go whale watching in Sydney. Had no idea you could do it there! I think a lot of people don’t know about it. What an amazing sight those whales are. How did you get such great shots? Well done! Thanks Cathy. As with all wildlife you need patience and just wait for a good shot. Great article. Really helpful info. Love the sightings graph. I think you made a very good point about keeping the expectations low because whales are not active all the time. I have been dolphin watching but not whale watching. I am planning a trip out to OZ next year and I think I may add this to my agenda as I am spending some time in Sydney visiting family. I went to do whale watching at jervis bay they had some amazing humpbacks but the journey out to the water made me very sick. I strongly recommend taking some anti-sea sickness medication with you. 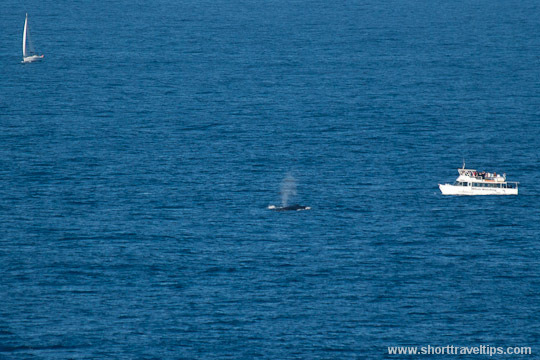 It’s very interesting how our whale watching seasons are polar opposites. Here, whale watching is from November (as early as October) to March. It looks like 2012 has been a great year for you guys too. One of the best places for land based whale watching – southern rights – is my hometown of Hermanus, near Cape Town in South Africa. Our season ended at the beginning of December and we had over 120 whales frolicking in the bay between August and December. While here are boat tours available, it’s a wonderful experience to witness the excitement on visitors’faces when a whale breaches just offshore. My favourite season of the year! Neville, yes, I was in Hermanus some years ago and it is perfect place for whale watching in Africa. Hi, Love your post about whale watching in Sydney and thought I could clarify a few points you raised. AM vs PM count from 2006-2009 we ran afternoon cruises all year and morning cruises during June July. This gave time for our whale spotters to find the whales first and send the boats straight to the location. The national parks 10year study shows no difference in numbers am- pm. Our joint research with Macquarie uni has concluded after 4 years. Results are due to be published soon, early indications are that the Australian regs of 100m has very low impact on migrating whale behaviour. I will forward more details when it is published later this year. Thanks Richard for your comment and I will wait to get that report. Awesome post of whale. I don’t know it’s real until you tell us. i’ve bookmarked your article, very useful guide for my future trip to Sidney. Australia is one of the best countries in the world for whale watching as more than 50 percent of the planet’s cetaceans – otherwise known as whales, dolphins and porpoises – are found here. Nine species of baleen whales and 36 species of toothed whales make their home in Aussie waters, and research suggests new species may well be found here in the future. And you managed to get some brilliant photos with iconic Sydney sites! Thanks Linda. I published this post 4 years ago, but updating it each year when whale season starts in Sydney. I wasn’t aware that you can do some whale watching activities in Sydney! I haven’t really had the chance to see a real whale personally, but I would love to in the future! Thanks for sharing these awesome photos of Sydney and the whales/dolphins. It actually burst my happy bubble to view one of the comments saying that they kill these wonderful creatures for food? in some countries..
i was planning towards Sydney great detailed and researched information you have provided there is something great in it. Wow. I would love to see this whale watching atleast once in my life. Thanks for sharing these info. Hope that I would get lucky to go and watch it myself. Whale watching is really an unforgettable experience. I have touched whales out on a trip like that in the ocean and I still get shivers every time I think about it. Ah, that’s really cool! I’ve been wanting to touch whales too. Just got no schedule for a travel yet. Wowza! Literally no idea you could see whales in Sydney. We saw loads in New Zealand but not in OZ! Hi! I ll be in Sydney from 11 to 21 of May this year, and I m dying to go for whalewatching. I m a little disappointed as I thought it was good to see them as from May, did not know it was not really May/more June 🙁 do you think it worth trying to book a tour? i ll be avaialble for it only on 3 days so I d like to book it long time before, to be sure not to miss it…also, it s hard to chose the tour, i was looking for a kind of “private” /not too busy tour with not too many people on the boat, is it possible to do so? thanks for your help! Last year (2013) the first tour was on 18th of May, but I don’t think any company will take bookings in advance, as every year season starts on different day depending on first whale sighting. I think it is better to contact tour companies then you’ll be in Sydney. I went whale watching some time ago in Central America and loved it. I would like to do something similar soon. Dear sirs, I will be in Sydney from 23 – 27 October this year. Would anyone advise me whether there is a chance for whale watching somewhere? I will be much appreciated I could book a boat tour for such great activity. I should be good chance to see whales at the end of october as they are migrating South at that time. You don’t need make booking so much time in advance. Check seats availability with any company listed above just before your trip to Sydney. Enjoy it! Thank you for sharing. The stats were most informative! I am interested in whale-watching but am concerned about the sea sickness factor. My family has been generally alright with 2hr ferry cruises but had a bad experience once with a 3hr Tasman island/Tasman sea cruise where even the guys were sea-sick by the end of the cruise (and the ladies badly so). The last 1.5hrs of the trip was a long and torturous wait for the cruise to end. Staying outside didn’t help much because it was very cold and wet. Worse, we will be in Sydney in end Aug – the month which you said would be rough seas. Do you think it’s a good idea to try again? My brother’s raring to go for it but my mum and sister dreads the idea of a 4hr cruise if it turns bad. We are considering OZ Whale Watching by the way. Were there a lot people who became sick onboard? They usually cancel tours if sea is too rough. So just check weather forecast while you in Sydney. The actual time in open sea is ~2-2.5h and the rest is in the harbor as it takes some time to get from Sydney CBD to the open sea. This blog intrigued me because whales are my absolute favorite animal! Though a little lengthy, the pictures kept me captivated. I had no idea there were so many options of how to or where to whale watch, definitely on my bucket list. I really appreciated the list, it made your blog more than writing but resourceful. During winter session i love to watch whale who makes many positions in the water. Great post, I would love to see a whale! I can’t believe I missed out on this when I was in Sydney last spring! Love this majestic creatures. They’re really gentle giants! I’ve only seen whale sharks and I’m interested to see humpback whales and other types of whales too. It must be an incredible experience to be able to spot and even dive alongside whales. I’ve had the experience of swimming alongside dolphins. Thanks for sharing this experience ! !